Chart patterns are formations of price predictive value which sometimes appear on the charts of assets. They are formed in different ways, but are usually seen when lines or curves have been drawn across major price support and resistance areas. The premise behind the use of chart patterns as price predictive tools is that changes in the trend of an asset are usually not abrupt events. There is normally a period of transition, which more often than not, is contained within the area covered by the price pattern. In order to use these patterns to predict price movements and setup trades, it is essential that the trader understands how to identify and use the pattern to make the correct trade entry and exit. 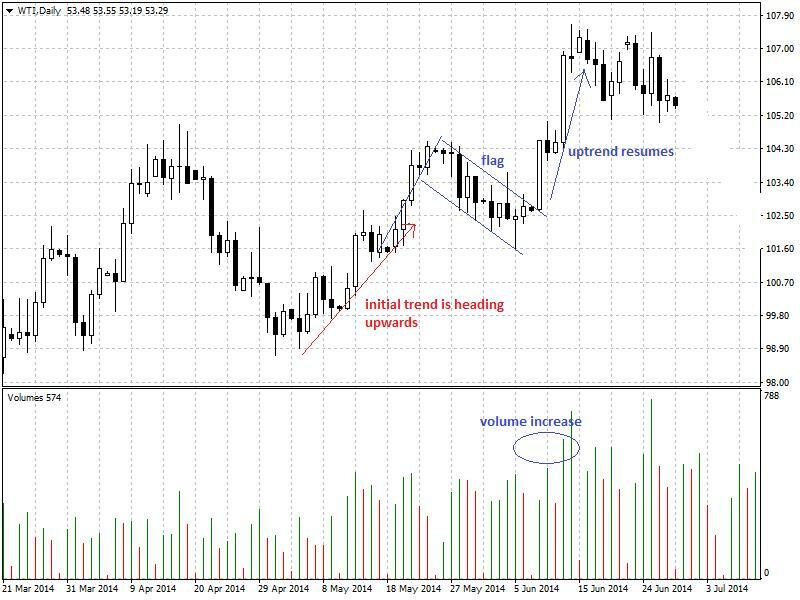 What are the points to consider when using the reversal patterns for trading purposes? You must consider the volume. If the volume has started to increase when the reversal has started to occur, then this strengthens the case for a reversal. In other words, volume increases at the time of completion of the pattern are indicative of a reversal. Increase in volume is very important when using bottoms to trade potential upside reversals. There must be a prevailing prior trend in place. One can only speak of a reversal if there is a prior trend. Bigger patterns produce bigger moves. In this case, the height as well as the width of the pattern is what is considered in terms of size. If the candles within the pattern are long, and the area between the commencement of the pattern and its termination is large, then the resultant price move is likely to be heavy. The signal for a reversal usually comes when a major trendline which defines the borders of the pattern has been broken. Downside reversals are often heavier than upside reversals. The presence of two troughs (two areas of price dip) which are roughly at the same level that form a characteristic “W”. There is a minor resistance which is formed by uptick of prices from the first bottom before it steps down to form the second bottom. A horizontal resistance line can be drawn across this minor resistance to form the neckline. The neckline forms the trend line which has to be broken for the upside reversal to begin. 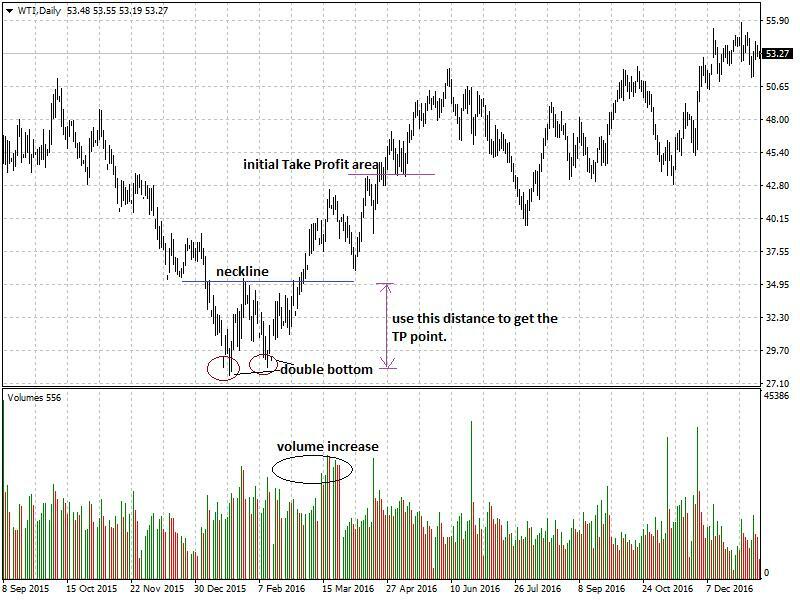 The Take Profit for the trade is usually the distance (in pips) between the neckline and the bottoms, projected upwards. A surge in volume at the break of the neckline to the upside confirms the trade entry point. The two areas where price have dipped from an initial downtrend to form the “W” double bottom pattern. The brief upside retracement to a resistance level, which can be delineated with a horizontal line to form the neckline. The neckline break after the second bottom has formed. Occasionally, the price may try to return to where it came from following the trend line break. In this instance, the broken trend line now functions as a support and rejects any downside price move. The price now heads upwards to complete the upward price reversal of the double bottom pattern. What are the points to consider when using the continuation patterns for trading purposes? There must be a prior trend in place. This trend move must not have been too extensive. The price candles then form a sideways pattern, a period of consolidation or a brief retracement. The tops and bottoms of this area can be enclosed with trendlines to form the characteristic pattern. Bigger patterns produce bigger moves. The signal for a continuation usually comes when a major trendline which defines the borders of the pattern has been broken in the direction of the previous trend. You must consider the volume. If the volume has started to increase when the trendline break has occurred in the direction of the previous trend, this makes a case for the continuation of the price action. For this example, we illustrate the flag continuation pattern. The initial trend is upwards, which is followed by a brief period of price retracement. The candlesticks which form the period of price retracement form a flag when the highs and lows are connected via a trend line. Once the upper trend line is broken (accompanied by a volume increase), the price resumes in the direction of the previous trend, which is upwards. It takes some practice to be able to identify and trade chart patterns. So get access to a demo platform with charting tools and practice how to trace and trade patterns so you can achieve a good degree of proficiency in chart pattern trading.